Jonas Pfeil was traveling in Tonga a few years ago when he noticed a few problems with travel photography. Surrounded by beautiful panoramas, he found himself taking series of photos with his DSLR and then spending a lot of time stitching them all together later on his computer. He decided to create a ball, now known as the Panono, that could take panoramic photos with the help of 36 embedded cameras. He created a prototype the size of a cantaloupe. In the second half of 2014, he and the Panono co-founders will ship a ball the size of a grapefruit for $599. Discounted preorders can now be made on IndieGoGo, which Panono is using to fund final work and manufacturing. 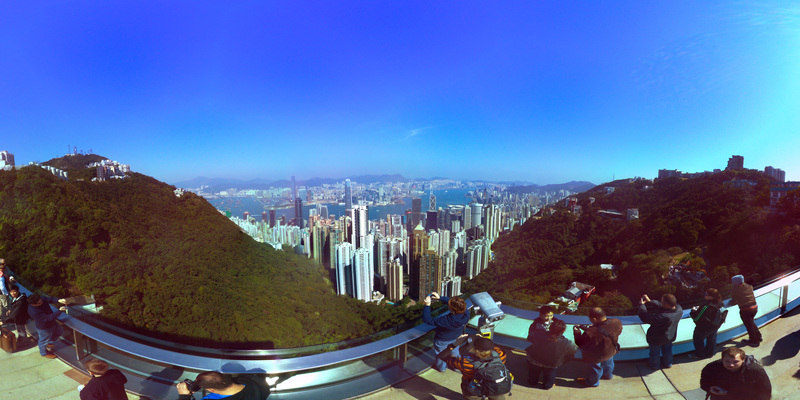 Panono users can hold the ball out and press a button to take a panoramic photo. Or, more interestingly, it can be tossed into the air to take a full 360 degree picture. The ball handles everything automatically. It judges when it is at the peak of the toss and takes a picture then. It beams the 36 photos from the cameras wirelessly to your mobile device, which then sends them to Panono’s cloud service to be stitched together. The final image is sent back to your phone or computer, where it can be viewed online or in Panono’s app. I had the chance to try a prototype version of the Panono in San Francisco’s Yerba Buena Gardens in early November. Yerba Buena is a great spot to use the Panono because it’s ringed by interesting sights: a fountain, skyscrapers, St. Patrick’s Church. No single shot from a normal camera can capture it all. It took three attempts for me to get the toss right; if the ball rotates too much, it won’t take a picture. But once I got it right, it wasn’t difficult to keep getting it right. Though the ball can survive a drop from 15 feet, it also feels a big nerve-wracking at first trying to catch it. That feeling soon fades. Pfeil said this is one of the more interesting features of the camera: It puts the picture taker in the frame. There isn’t a need to arrange a group in an artificial clump; everyone can stay where they are in an area and just look at the camera. The ball can also be put on the end of a pole to take pictures inside, where poor light might call for better stability or ceilings might pose a nuisance to tossing it over and over. Panono’s app will be one of the ball’s greatest strengths. When you pull up an image from you or a friend’s archives, you can physically turn your body and your mobile device to pan through the image. For anyone who has ever stood atop a monument and wished there was a way to preserve everything they saw, this is a really immersive way to do it. Why would I spend $599, when I can download Bubbli for free which does a much better job on my regular iPhone?